Improving drug therapy in elderly patients—the Good Palliative–Geriatric Practice algorithm. Revised from Garfinkel et al12 with permission from the Israel Medical Association Journal. Background Polypharmacy and inappropriate medication use is a problem in elderly patients, who are more likely to experience adverse effects from multiple treatments and less likely to obtain the same therapeutic benefit as younger populations. The Good Palliative–Geriatric Practice algorithm for drug discontinuation has been shown to be effective in reducing polypharmacy and improving mortality and morbidity in nursing home inpatients. This study reports the feasibility of this approach in community-dwelling older patients. Methods The Good Palliative–Geriatric Practice algorithm was applied to a cohort of 70 community-dwelling older patients to recommend drug discontinuations. Success rates of discontinuation, morbidity, mortality, and changes in health status were recorded. Results The mean (SD) age of the 70 patients was 82.8 (6.9) years. Forty-three patients (61%) had 3 or more and 26% had 5 or more comorbidities. The mean follow-up was 19 months. Participants used a mean (SD) of 7.7 (3.7) medications. Protocol indicated that discontinuation was recommended for 311 medications in 64 patients (58% of drugs; mean [SD], 4.4 [2.5] drugs per patient overall, 4.9 per patient who had discontinuation). Of the discontinued drug therapies, 2% were restarted because of recurrence of the original indication. Taking nonconsent and failures together, successful discontinuation was achieved in 81%. Ten elderly patients (14%) died after a mean follow-up of 13 months, with the mean age at death of 89 years. No significant adverse events or deaths were attributable to discontinuation, and 88% of patients reported global improvement in health. Conclusions It is feasible to decrease medication burden in community-dwelling elderly patients. This tool would be suitable for larger randomized controlled trials in different clinical settings. In a previous study, the geriatric-palliative approach and algorithm for drug discontinuation were proven effective and safe in disabled patients in nursing home inpatients in Israel.12 Drug discontinuation was not associated with significant adverse events; only 10% of the drugs stopped had to be readministered because of the return of the original indication for the drug. In addition, the annual rate of both mortality and referrals to hospitals significantly decreased compared with the control group. The present study tests the feasibility of applying the same algorithm in community-dwelling elderly patients. This prospective cohort study included consecutive elderly patients referred by their family physician or family for comprehensive geriatric assessments from February 2005 through June 2008 and excluded patients with advanced disease (cancer or noncancer) in whom the initial estimate of life expectancy was less than 3 months and patients in whom follow-up availability was shorter than 4 months. Participants were assessed and recommendations were made on medications based on the Good Palliative–Geriatric Practice (GP-GP) algorithm (Figure).12 Assessments were performed either at the day care center for senior citizens in Pardes Hana or at the patient's home in Israel. The rationale for recommendations was then explained and discussed in detail with each patient and/or guardian/family. They were informed of the pros and cons of each medication prescribed, the level of evidence for a positive benefit to risk ratio and its possible impact on longevity and quality of life. Following this discussion and based on patient and/or guardian/family preferences and consent, detailed letters were sent to the family physicians with recommendations to stop as many “non–life saving drugs” as possible for at least 3 months. When stopping a drug therapy was not considered appropriate, dose reduction or shifting to a better drug was considered. An evidence-based approach was used within the algorithm (Figure): when no evidence base existed for drug use in elderly patients, the approach was based on clinical judgment only, and the balance of risks and benefits of the drug for the individual were presented to the participants and families. When several antihypertensive drugs were used, discontinuation was staggered, stopping one drug therapy at a time, while maintaining the dosage of other drugs without change. Failure of discontinuation for these drugs was defined as increases in diastolic blood pressure (BP) above 90 mm Hg and/or systolic BP above 150 mm Hg (or 160 mm Hg in patients with no evidence of target organ damage). Discontinuation of nitrates was tried in patients who had no chest pain for 6 months, and failure was defined as the return of symptoms or electrocardiographic changes. Histamine type 2 (H2) blockers and proton pump inhibitors were discontinued in patients with no proven peptic ulcer, gastrointestinal tract (GI) bleeding, or dyspepsia for 1 year, and failure was defined as the return of upper GI symptoms. With few exceptions, all benzodiazepines were gradually discontinued as well as all nonsteroidal anti-inflammatory drugs. Discontinuation was considered for oral hypoglycemic and lipid-lowering drugs, antidepressants, antipsychotics, levodopa, digoxin, diuretics, anticoagulants, aspirin, dipyridamole, pentoxifylline, potassium and iron supplements, and vitamins. All participants were carefully monitored for any change in symptoms, signs, or relevant laboratory and diagnostic test results that were the original indications for starting the medications. In patients with diabetes, a hemoglobin A1c level of less than 8% was considered acceptable. “Intervention failure” was defined as recurrence of these clinical symptoms or signs or worsening laboratory test results (eg, symptoms of congestive heart failure, dyspepsia, or parkinsonism following discontinuation of furosemide, H2 blockers, or levodopa, respectively; and increase in BP, anemia, or hypokalemia following discontinuation of antihypertensives, iron supplements, or potassium supplements, respectively). Whenever discontinuation failed, the drug therapy was restarted. Follow-up assessments were performed in all patients every 3 to 6 months, initially face to face, with some later assessments by telephone with the patient, guardian/family, and/or family physician. Each follow-up assessment gathered data on all medications taken at that time, intervention failures, new drugs taken, and significant new health problems (clinical events, symptoms or signs, and hospitalizations or death). Functional, mood, and cognitive status were evaluated. The short Geriatric Depression Scale was used to assess depression when relevant, and the Mini-Mental State Examination was used to assess cognitive function in all patients when relevant. 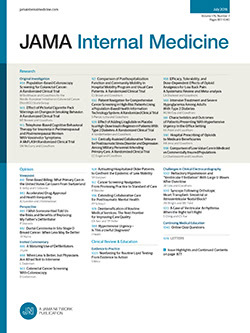 Patients and families were asked to give a global assessment of perceived general health considering mood and functional and cognitive capacity on a modified 5-point Likert scale (−2 to +2), rating any change in their perceived general health and quality of life: significant worsening, −2; mild worsening, −1; no change, 0; mild improvement, +1; and significant improvement, +2. Statistical evaluation was performed using SPSS version 15.0 (SPSS Inc, Chicago, Illinois). Between February 2005 and June 2008, 75 consecutive potentially eligible patients were identified. Five patients were diagnosed as having a life expectancy shorter than 3 months; they were given GP-GP recommendations but were excluded from the study analysis (all 5 died within 3 months). Of the 70 patients who were enrolled after this exclusion, 6 did not need drug discontinuation after assessment with the tool, and in the other 64 patients, at least 1 drug was discontinued. Among the 70 eligible participants, 43 (61%) were women, and the mean (SD) age was 82.8 (6.9) years (range, 67-102 years). Functionally, of the 70 patients, 18 (26%) were defined by the geriatrician (D.G.) as independent and ambulatory, 40 (57%) were defined as frail and ambulatory, 12 (17%) were disabled (required assistance with activities of daily living), and all were living in the community. The Mini-Mental State Examination was performed in all 70 participants and the score ranged from 0 to 30 (mean [SD] score, 18.2 [9.4]). The Geriatric Depression Scale was performed in 33 patients in whom it was clinically relevant and possible (score range, 1-12; mean [SD], 7.39 [3.62]). Table 1 lists the health problems of the 70 participants; 43 (62%) had more than 3 diseases, 31 (44%) had 4 or more, and 18 (26%) had 5 or more. Fifty participants (71%) had 3 or more of the “geriatric syndromes.” Considering all health problems together (diseases + syndromes), 66 patients (94%) had 3 or more, 55 (79%) had more than 4, and 36 (51%) had more than 6. No participants had advanced cancer. Following the initial medication recommendations, no patients were lost to follow-up. There was a 100% response rate to patient/family questionnaires. The mean (SD) follow-up period was 19.2 (11.4) months (range, 4-45 months). The 70 participants initially took a mean (SD) number of 7.7 (3.7) medications (range, 0-16), including a mean of 0.8 vitamins or minerals per patient. Six patients had no basis for drug discontinuation. A trial of discontinuation based on our algorithm was recommended for 64 patients for 311 medications (58% of all drugs; mean [SD], 4.4 [2.5] drugs per patient in the total cohort); in those in whom discontinuation was recommended this represents a mean of 4.9 drugs per individual patient. After consultation with and consent from patients, guardian/family, and family physicians, 256 of 311 medications (82%) were discontinued (47% of drugs; mean [SD], 4.2 [2.5] drugs per patient in the overall cohort). Of the 64 participants in whom recommendations were made, 42 (66%) discontinued all the drugs suggested and 16 (25%) discontinued all except for 1 of the drugs recommended to be discontinued. In the other 6 of the 64 patients (9%), the family or family physician did not wish to take up the recommendations for a trial of discontinuation for all or most of the drugs. Only 6 of 256 drugs discontinued were later readministered by the family physician due to symptom recurrence (2% failure rate); a β-blocker, iron supplements, simvastatin, and selective serotonin reuptake inhibitor each in 1 patient and furosemide in 2 patients. Taking nonconsent and failures together, successful discontinuation was achieved in 81% of the suggested medications. While some dose reductions were made, the only study measure was complete discontinuation, so the changes reported were true discontinuations. Table 2 gives the success rate of this approach for different types of medications: 84% of antihypertensives could be safely discontinued (sometimes even 4 different BP-lowering medications). Of the 48 participants taking antihypertensives, discontinuation was recommended in 39 (81%). Eventually, of these 39 participants, 5 (13%) did not try to discontinue the medication, 15 (38%) no longer required any, and 11 (28%) continued using 1 antihypertensive medication (5 were previously using 2, another 5 were using 3, and 1 was using 5). Successful discontinuation of 75% or higher was achieved for other commonly used drugs including nitrates, furosemide, H2 blockers, and omeprazole and almost 100% successful discontinuation was achieved for benzodiazepines. Aside from return of symptoms in a small number of patients as described, there were no significant adverse events reported. On the global assessment scale (n = 64), the mean (SD) score was 1.43 (0.88). No one reported significant worsening (Likert scale score, −2), and 56 (88%) reported overall improvement. Among this group, improvement was defined as significant (Likert scale score, +2) by 43 (67%). In 3 elderly patients (ages 84, 85, and 73 years) a substantial improvement of cognitive impairment was observed (increases in absolute Mini-Mental State Examination score from 14 to 24, from 14 to 23, and from 14 to 30 at 6 to 8 weeks after discontinuation of 7, 7, and 6 drugs, respectively). All of the reported 56 improvements of cognitive impairment were reported in the first couple of months following drug discontinuation and, except for 3 of 10 patients who eventually died, were maintained throughout follow-up assessments. Ten participants (14%) died during follow-up; the mean (SD) overall time until death was 13 (9) months (range, 4-33 months). The mean age of death was 89 years (range, 82-102 years). One patient with severe congestive heart failure died in hospital after 6 months of follow-up. Three died of sepsis during hospitalization (ages 87, 88, and 102 years; follow-up of 13, 18, and 6 months, respectively). Four died at home (ages 83, 91, 93, and 93 years; follow-up of 9, 11, 9, and 33 months, respectively). No deaths were considered to be related to the original indications for the drugs discontinued. Of 10 patients who died, 7 had reported improved quality of life in their last period of life. Autopsies are not routinely done in Israel and were not performed in participants who died. One woman aged 87 years who had severe vascular dementia died peacefully at home (probably of recurrent stroke) after only 4 months. The only participant younger than 70 years in whom 6 drugs had been discontinued (disothiazide, glibenclamide, theophylline, oxybutynin, betahistine, and pentoxifylline) remained normotensive and normoglycemic after drug discontinuation. He had severe comorbidity (metabolic syndrome, severe ischemic heart disease, recurrent strokes, chronic obstructive pulmonary disease, and dementia) and experienced sudden death at the age of 69 years after 22 months of follow-up. Other than death, different major events requiring hospitalization were reported in 10 participants (Table 3). Except for 1 patient in whom a relationship was possible (development of deep vein thrombosis 3 months after stopping warfarin therapy, which was initially prescribed for atrial fibrillation), all other major events were considered not related to discontinuation. In 45 participants, new drugs or change in dosage or type of medication were recommended as a result of the application of the GP-GP algorithm. Most frequently recommended were antidepressants (in 16 participants) following clinical and then formal assessment with the Geriatric Depression Scale. This article reports the feasibility of applying an algorithm for a trial of discontinuation of all drug therapies not immediately essential for life. The study shows that this framework is feasible and rarely requires restarting medication regimens in community-dwelling elderly patients. Though causality cannot be proven for the improvements in perceived global assessment, this framework had already been proven to do that among disabled elderly patients in long-term care in a randomized controlled trial (RCT),12 so patient and/or guardian/family reports of improved quality of life in this study would also suggest that quality of life may be enhanced by this approach. Using the same algorithm as the RCT, we found that the results of this feasibility study in community-dwelling elderly patients are similar, based on a mean follow-up of 19.2 months. Discontinuation of a mean (range) of 4.2 (1-11) different medications in the cohort was safely achieved with no significant adverse events or deaths related to discontinuation. Only 2% of drugs had to be readministered; in 88% of elderly patients, application of the GP-GP algorithm was associated with subjective clinical, functional, mood, or cognitive improvement. There are limitations to the study. This small sample is not representative of the heterogeneous population of community-dwelling elders and may also not be representative of the population of older adults who are followed up in the primary care setting. However, the number of comorbidities and medication use is similar to what is known of this population. There is no data to assess whether the success merely stems from the fact that the patients were inappropriately treated before the project: there was a high rate of obviously problematic drugs—half of the cohort was taking benzodiazepines, approximately 20% were taking antiparkinsonian drugs, and approximately 25% were taking furosemide (although only one-third of this number had heart failure). This baseline may vary between different geographical and cultural settings. The self-rated improvement reported could have been a placebo effect or regression to the mean over time. However, in this subpopulation with severe comorbidity (mean [SD] age, 82.8 [6.9] years), it seems unlikely that the natural history in 88% would be subjectively defined as overall improvement owing to a placebo effect. This effect was not seen in the original RCT, and the rates of return of measurable symptoms or signs of the original indication are robust indicators of effect. Improved medical technology in the last century has resulted in a notable increase in lifespan in general, and in patients with chronic, life-shortening diseases in particular. Very few adults and elderly persons die suddenly while apparently healthy; most experience time-related increases in the number of incurable comorbidities, disability, and suffering for increasingly prolonged periods before death. This unprecedented situation in human history makes models of “one disease—one therapy/guideline” an unrealistic approach to good care in most adults; almost half the people older than 65 years have 3 chronic conditions, with 21% having 5 or more,11,13 and a single disease approach for each is likely to lead to polypharmacy. Drugs are being given at different points along patients' lives by a growing number of different specialists who prescribe medications for specific problems in their field of expertise along single disease guidelines. Older patients and those with significant comorbidity are usually excluded from evidence-generating RCTs.14-16 However, it is much easier to start therapies than to stop them. It is also easy to overlook medication adverse effects on a background of complex comorbidities. The physician may be reluctant to review decisions or discontinue or change drug regimens determined by “experts” or from guidelines for younger populations. A scheduled, formal drug reevaluation may never be performed, neither in hospitals or long-term care setting nor in the community. There are good rationales for back-titration of drug dosages at an older age. A patient who has received antihypertensive drugs or nitrates when still independent and active may not need the same regimen years later when disabled or frail, making minimal physical efforts and with possibly reduced body mass. Though there is evidence for benefit in treating hypertension in fit, very old patients,19 overenthusiastic attempts to lower systolic and diastolic BP may increase mortality and morbidity.20,21 Larson22 warns that guidelines and pay-for-performance incentives may drive clinician priorities to strive for better “numbers,” placing less priority on the well-being of older patients. Similarly, Mangin et al9 argue against current trends that encourage preventive interventions along single disease lines regardless of age and note as an example that in elderly patients, pravastatin had no beneficial effect on all-cause mortality and morbidity, simply trading one source of morbidity and mortality for another. No data were found to determine clinical guidelines programs in older diabetic patients. In frail (unlike robust) elderly patients with diabetes, in those with short life expectancy, and when the risks of intensive glycemic control outweigh the benefit, a less stringent target for lowering hemoglobin A1c level (such as 8%) should be recommended23: avoiding the morbidity associated with hypoglycemia rather than achieving perfect glycemic control should represent the main goal. The US Preventive Services Task Force found no evidence for recommending aspirin in people older than 80 years.24 Furthermore, patients may also have a life expectancy that is shorter than the time needed to benefit from specific drugs prescribed. In older populations a “reverse extrapolation” is more appropriate. Most people would probably agree that continuing any drug other than palliative medicines is inappropriate in the last hours, days, and even weeks before death.25 However, extrapolating back from this is difficult. Callahan26 talks about the notion of technological brinkmanship: All agree that there is a point beyond which treatment has more harm than benefit, but without an effective way to approach this, treatment is continued as the “brink” is not recognizable. This new GP-GP represents an appropriate approach, both clinically and ethically, allowing for the flexibility to restart medicinal therapies and appears to be feasible in both nursing home and ambulant patients. While the framework for assessing preventive health care in elderly people needs rethinking,9 the present study demonstrates that each and every drug regimen in an older person, including drugs used for symptom relief, needs to be rethought. The original symptoms may have disappeared. In addition, the level of symptoms must be balanced against the symptoms of drug adverse events, particularly anticholinergic effects. Many elderly patients continue to take benzodiazepines for sleep and H2 blockers or metoclopramide for past dyspepsia or nausea. Others continue taking medications for past dizziness and preparations containing combinations of nonsteroidal anti-inflammatory drugs, propoxyphene, caffeine, opioid derivatives, and/or antihistamines (ie, “anticold” preparations). The name “Good Palliative–Geriatric Practice” was chosen because this tool is based on principles of both fields. For professionals in palliative medicine and particularly in hospices, stopping drug therapies other than for symptom control is a common practice. These principles, which might mitigate against polypharmacy, are less well held in geriatric medicine. Many rely on updated Beers criteria4,27 with the hope that they may serve as an alarm system to increase physicians' alertness and avoid specific drugs in elderly patients. However, there are unsuccessful attempts to achieve global consensus for the Beers criteria.1,2,28 It is difficult to conclusively defend or refute the use of most drugs listed by Beers,29 and it was concluded that drugs-to-avoid criteria are insufficiently accurate to use as stand-alone measures of prescribing quality.30 Furthermore, the Beers approach may be misleading: prescribing 10 to 15 “non–Beers list” medications to patients is still likely to do more harm than good. Our results support minimizing drug load using a broader approach that will accommodate changing evidence. This approach is not ageist. We do not extrapolate from single-disease guidelines in adults to infants and children, so there is no rational basis for doing this in older patients—both subpopulations are much more vulnerable to drug adverse effects. Polypharmacy itself should be conceptually perceived as “a disease,” with potentially more serious complications than those of the diseases these different drugs have been prescribed for. The finding that simultaneous discontinuation of many drugs is not associated with significant risks and apparently improves quality of life should encourage physicians to consider testing this GP-GP tool in larger RCTs across a variety of medical cultural settings. Polypharmacy may have different faces in different countries or clinics but there is no doubt that the problem is global. This approach has international relevance; it combines our best existing evidence with patient-focused care while actively avoiding extrapolation from inappropriate populations where no evidence exists for treatment in elderly patients. The investigators of this study have put the theory of “less is more” into practice. They used an established tool to discontinue medications taken by community-dwelling older persons. Remarkably, they discontinued 311 medications in 64 patients with no significant adverse reactions; 84% of patients reported an improvement in health. Clearly, outpatient medication use among older persons is a case where less is more. Correspondence: Doron Garfinkel, MD, The Shoham Geriatric Medical Center, Pardes Hana 37000, Israel (dgarfink@netvision.net.il). Accepted for Publication: March 2, 2010. Author Contributions:Study concept and design: Garfinkel. Acquisition of data: Garfinkel. Analysis and interpretation of data: Garfinkel and Mangin. Drafting of the manuscript: Garfinkel and Mangin. Critical revision of the manuscript for important intellectual content: Garfinkel and Mangin. Administrative, technical, and material support: Garfinkel and Mangin. Study supervision: Garfinkel.